It’s Wednesday and you know what that means- Top Chef DC! Ya ya I know. The season hasn’t lived up to previous seasons and it probably rivals Real Housewives of DC when it comes to local watchability. However we can expect some DC flavor in tonight’s episode. 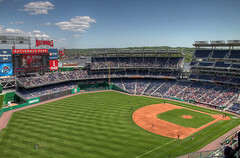 The elimination challenge takes place at Nationals Park where teams will run two concession stands and try and serve up fare that exceeds the Five Guys and Half Smokes you would expect on Gameday. Nats players Adam Dunn, and John Lannan make appearances as well as former closer Matt Capps. Seafood chef Rick Moonen will appear as a guest judge as well. What else can you expect? Well with Alex gone Ed will set his sights on another annoying contestant and Angelo will continue to baffle me with his eccentricity. Expect a recap tomorrow complete with some insider views on the Nationals Park tasting. Patrick has been blogging since before it was called blogging. At We Love DC Patrick covers local Theatre, and whatever catches his eye. Patrick’s blog stories, rants, and opinions have been featured in The Washington City Paper, Washington Post Express, CNN, Newschannel 8 Washington, and NBC Washington. See why Patrick loves DC.